I know someone who was given the assignment to read through the Bible and summarize each chapter. I decided this would be a great project to co-opt to increase my own understanding in a disciplined way. So far, I’ve completed the Old Testament. My plan is to type up my notes and do some reflecting on what I’ve learned. When the lectionary for the Book of Common Prayer recently took me to the book of Esther, I thought this would be a good place to start—a shorter book, easier to get my arms around*. For the book of Esther, I had already written a sentence to summarize each chapter. As I re-read, I wrote a haiku to explain each chapter. Queen Vashti refuses to model for the guests of King Ahasuerus (Xerxes) so she is banned from the king’s presence as a lesson to all women on how to behave. Haman is promoted to chief official. When Mordecai, a Jew, won’t bow, Haman decides to kill all the Jews and receives the king’s permission to do so. As the Jews mourn, Mordecai puts on sackcloth and ashes and asks Esther to help. Esther agrees to talk to the king and asks the Jews to fast. Esther is granted a wish by the king. She has a banquet for the king and Haman and invites them to another banquet. Haman creates a gallows for Mordecai. The king is reminded of Mordecai’s loyalty and, without telling him why, asks Haman how to honor someone. Haman assumes it’s he who is to be honored and inadvertently elevates Mordecai. Esther asks for the life of her people. In a stunning reversal, Haman is executed on the gallows he had built. The king empowers Esther to revoke the order to kill the Jews and there is great rejoicing. A second reversal: Those who intended to kill the Jews are killed by the Jews. Haman’s sons are executed. The 14th–15th of Adar is a holiday. Pur = “lots”. Festival of Purim. —This is an intriguing, compelling story. It’s a page-turner. Things are a matter of life and death. Actions have consequences. —It’s also a disturbing story. There are aspects that are quite uncomfortable for me to think about: Life is cheap; racism is rampant; women don’t have it so good. —In addition to the dark moments, there are some funny ones, too. —Isn’t it a little odd that in this book of the Bible there is no mention of God? —Interesting to think of this story in the context of the larger story of God’s purposes. In a way, this is a story of revenge: “What you intended for evil, we gave right back to you. The story opens with a crisis in the court of King Xerxes (Ahasuerus in the ESV). Xerxes had a large kingdom (127 provinces) and decides to throw a giant party to show off “the vast wealth of his kingdom and the splendor and glory of his majesty.” As a kind of finale to these extended festivities, Xerxes decides to have a seven-day-long banquet complete with open bar and no limits (obviously not worried about drinking and driving). At the end of seven days, Xerxes decides a great thing would be to have his attractive wife, Queen Vashti, come in “wearing her royal crown, in order to display her beauty to the people and nobles, for she was lovely to look at.” There is something more than a little creepy about this, in what I think we can agree today is a misogynistic command. Perhaps Vashti thought so, too, as she refuses to do it. This is a problem. When the king commands, you obey. It doesn’t really matter who you are. The king doesn’t know what to do, so he decides to consult “experts in matters of law and justice . . . wise men who understood the times.” These guys conclude that Vashti’s behavior is a big problem on two levels. One is the basic disobedience to the king. More importantly, is what happens when other women around the kingdom get word that Vashti didn’t obey her husband? What if they take her lead and don’t obey their husbands? Their conclusion: “There will be no end of disrespect and discord.” And so a law is created “which cannot be repealed” deposing Vashti who can never again enter the king’s presence. This law is circulated around the kingdom just to make it clear to everyone in the kingdom (mostly the women) who’s in charge around here (the men). Eventually Xerxes calms down and his personal aids decide it’s time to have a Miss Persia contest to find a replacement for Vashti. If what was asked of Vashti was a little creepy, this contest is on another level entirely. A search is made throughout the kingdom “for beautiful young virgins for the king.” They are to be given beauty treatments and the one who “pleases” the king will get to be the new queen. By a prior agreement with her adoptive guardian, Mordecai, Esther doesn’t tell anyone she is Jewish. For twelve months each girl is given beauty treatments and then “she would go to the king,” which I assume is euphemistic for a sexual encounter. (The Miss Persia contest feels a lot like a prostitution ring for one client, King Xerxes, with the proviso that the winner gets to become king. No explanation what happens to the runners up.) The end result is that Esther won the king’s favor, was named Queen, and a big banquet was held in her honor. Meanwhile, Esther’s guardian, Mordecai, has been hanging around the king’s gates to stay in touch with Esther. He overhears a plot by two of the king’s officers to assassinate King Xerxes. He tells Esther who reports it to the king. An investigation ensues and when the truth is discovered the two men “were impaled on poles.” Best not to think about that too much. The story shifts. King Xerxes decides for unknown reasons to honor Naman, one of his officials. He is elevated above everyone else and, by command of the king, everyone else in the kingdom has to bow down to him. Mordecai refuses. And when people ask him about it, it comes out that he is a Jew. The text says Haman was “enraged” and decides that he wants to figure out a way to destroy not just Mordecai, but all of the Jews in the kingdom. A lot was cast and a date was determined for this annihilation—in the twelfth month, Adar. And then Haman throws in a bribe. If Xerxes will issue a decree to destroy the Jews, Haman will put ten thousand talents into the royal treasury. This is a staggering sum. The NIV note says this is 375 tons, which my math says is an eye-watering $176,640,000 (375 tons x 2,000 pounds per ton x 16 ounces per pound x $14.72). The king agrees but says Haman can keep his money. He gives Haman his signet ring, which gives him the power to create laws. Notices are created which are sent around the kingdom: On the 13th day of the 12th month (Adar), all the Jews are to be killed. This is horrifying, to say the least, especially with our knowledge of the Holocaust of the last century. Mordecai goes into mourning. He “tore his clothes, put on sackcloth and ashes, and went out into the city, wailing loudly and bitterly.” And not just Mordecai. As Jews around the kingdom hear about this decree announcing their demise, each engage in similar practices. They have a death sentence and there’s seemingly nothing that can be done. Esther, living inside the palace apparently doesn’t know anything about this decree. When she hears that Mordecai is “in great distress” she sends him clothes, but he refuses to take them. Finally, Esther sends Hathak, one of the king’s eunuchs (now there’s a job), out to ask Mordecai what’s going on. Mordecai explains the situation and passes on the message that Esther should go see the king. Esther explains that this may not go well for her. Anyone who approaches the king without being summoned runs into a law that says you will be “put to death unless the king extends the gold scepter to them and spares their lives.” Esther further explains that it had been thirty days since she had been in the king’s presence. It feels risky. After three days, Esther went in to see King Xerxes. When he saw her, he extended his scepter, sparing her life. Phew. But it went better than mere acceptance. Xerxes then asked her what she wanted and because she pleased him so much said he was willing to give her up to half of his kingdom. (I’d call this hyperbole, but he will repeat this statement.) Esther simply asks that the king and Haman come to a banquet she had prepared. At the banquet, Xerxes asks Esther again to tell him what she wants. She says that if he and Haman come to a banquet the next day, she will tell him. A couple of things happen now that make things very interesting. First, Haman goes home bragging that he is so favored in the kingdom that the Queen wanted he alone to attend these banquets with the king. But he can’t enjoy his status because he can’t get “that Jew Mordecai” out of his mind. Haman’s wife has a great idea to set up a 75-foot tall pole to impale Mordecai on. That made Haman feel better. Meanwhile, back in the palace, the king can’t sleep and asks that the records of his reign be read aloud to him. (Is that so he will go back to sleep? Or is this one of those tasks he engages in on sleepless nights? Answer unknown.) In those records is the story of how Mordecai had once prevented his assassination. Xerxes asked what had been to honor Mordecai. When the answer came back, “Nothing,” Xerxes decides to call in his highest official Haman to figure out what should be done. Haman later goes home in a panic. He tells his wife, friends, and advisers what has happened. 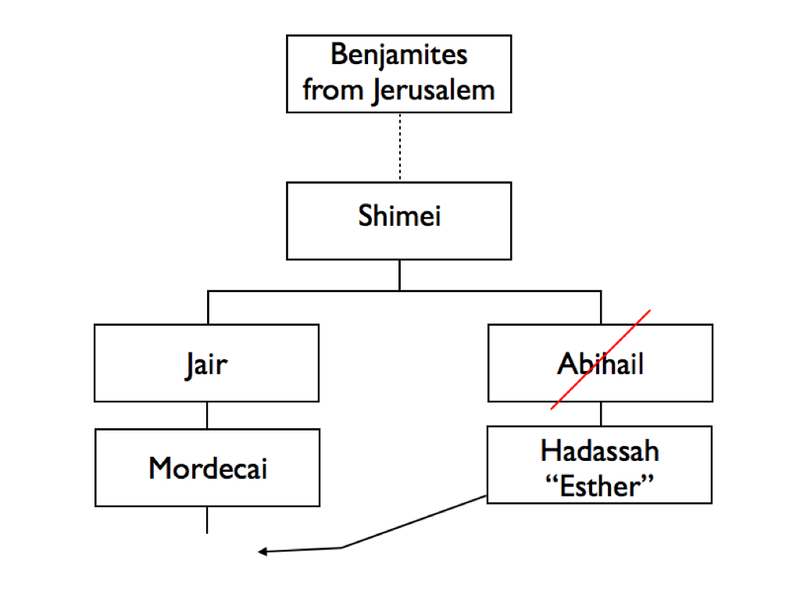 Haman’s wife, Zeresh, states the obvious that since Mordecai is Jewish, he can’t oppose him. Not recorded in the text, but somehow I think Mordecai at least thought, if not said aloud, “That much I know.” Before they can get any plan together, Haman is taken by the king’s eunuchs to the banquet Esther has arranged. The king in a rage leaves the room. The second funniest moment comes next as Haman, realizing that he is in a world of hurt, goes to Esther to beg for his life. The king returns to the room and sees Haman with Esther and concludes that Haman is trying to molest her. In a stunning reversal of near ultimate proportions, Haman was impaled “on the pole that he had set up for Mordecai.” When Xerxes calmed down, he gave Esther Haman’s estate. Esther approached the king again, and after the scepter was for a second time extend to her, now pleaded, with tears, for Xerxes to save her people. She asked that an order be sent out to countermand the one calling for the death of the Jews. Mordecai was also promoted to second-in-command in the kingdom and given the king’s signet ring. On the 13th of Adar, instead of death for the Jews, the Jews attacked their enemies. In the city of Susa, 500 men were killed along with Haman’s 10 sons, who were also impaled on poles. Around the kingdom, the Jews killed 75,000 of their enemies, though they didn’t take any of their property. *Easier as compared to some other books of the Hebrew Scriptures, but not in any way easy. The Bible is an incredibly complicated book.